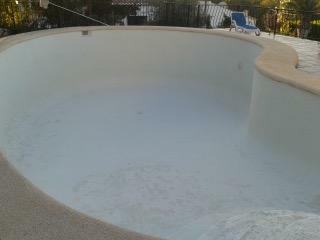 How do I remove lime scale (Calcium) from my swimming pool and keep it looking at its best. 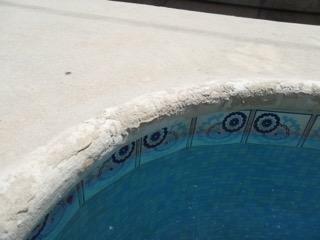 Lime-Scale stains are a particular problem on many swimming pools, Calcium often called “lime scale”, occur around the top edge of a pool and look like white or gray crusty deposits. The build up of scale occurs over time and is more often than not caused either by hard water or by minerals that seep out of nearby tile mortar. If left in place, they may result in permanent stains on the tile as well as causing the pool to look dirty and unattractive. 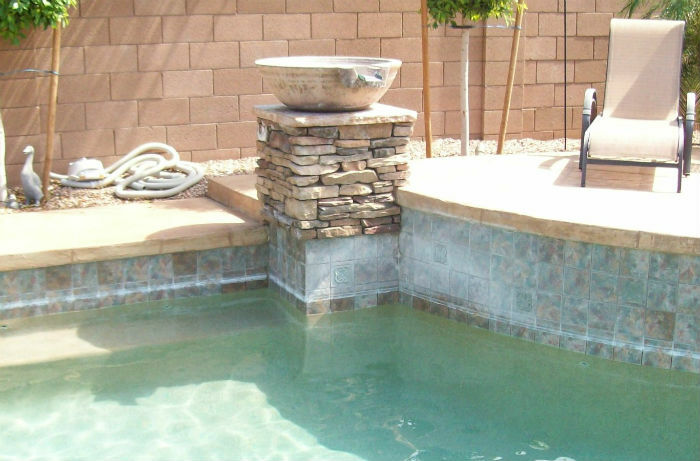 Removing the calcium deposits from pool tiles will require some physical effort. Unfortunately, you’ll have to repeat the process periodically, since the stains often return. Once you have removed the stains and have balanced the total Alkalinity of the swimming pool it should just be a case of a little elbow grease occasionally to the boarder tiles to keep your pool looking pristine. 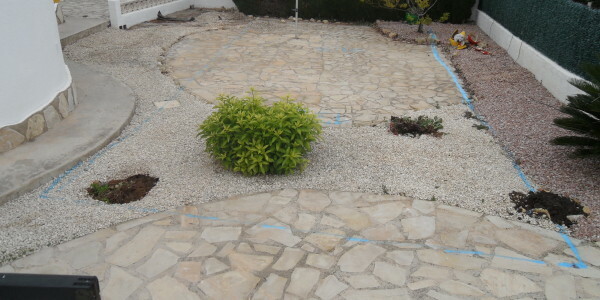 A point to note, border tiles which are white or of a light color will always tend to look dirtier and grubbier in areas (Benitachell, Moraira, Cumbre del Sol ) where the water is hard. 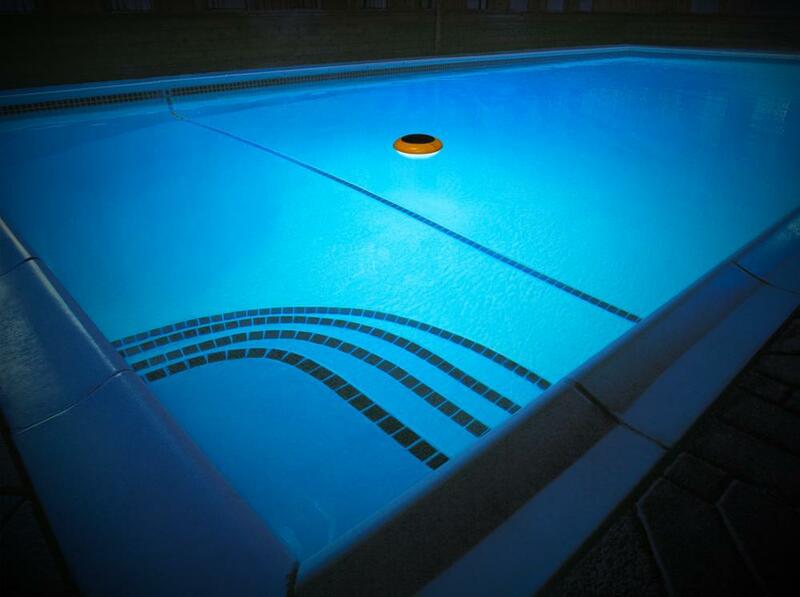 These days swimming pool lighting is available in a wide variety of colors and styles. Far from the days of standard “bright” white you can now change the color range with a remote control. 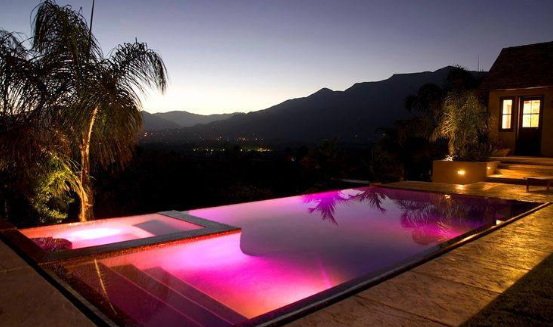 You do not even have to install any additional cables if your pool does not already have lights. On the controller you now have the option to set your own program of sequenced lighting or quite simply pick and choose the colour that sets the mood instantly. This includes variable speeds and fade for the lighting from one colour to another. Apart from the flexibility of changing the sequencing of the colors and the speed one of the great advantages is the negligible consumption of electricity used by LED lighting as compared to the standard pool lighting most people have in their swimming pools. 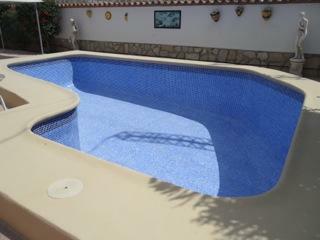 Like all constructions swimming pools will require work in their lifetime to keep them in perfect condition. 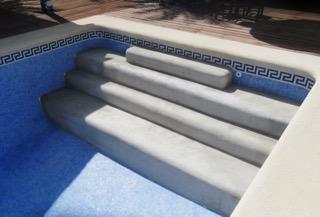 This can be from an acid wash and re-grouting to retiling, installation of entrance steps into the pool. In addition to these aesthetic works, owners may experience problems such as leaks, cracks, staining of tiles, or problems with pipe work and plumbing. 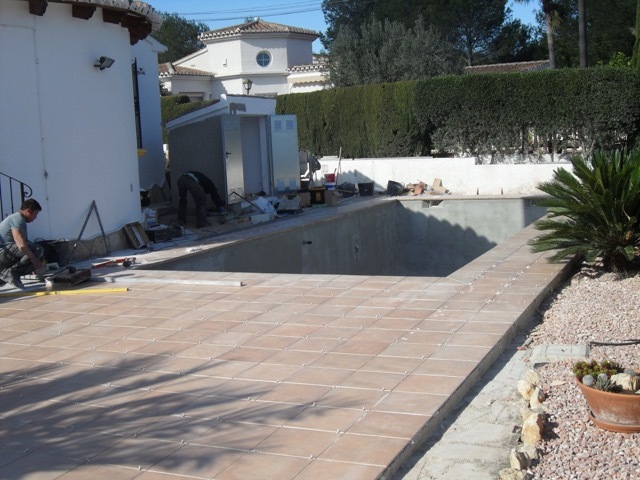 On this swimming pool in Cumbre del Sol the clients needed to make it easier for a disabled member of their family to get in and out of the swimming pool. The original pool had stainless steel ladders that the family member could not use. We installed full width steps with two rows of dark blue tiles along the step edges for safety. We also installed a made to measure stainless steel handrail in the centre of the steps. 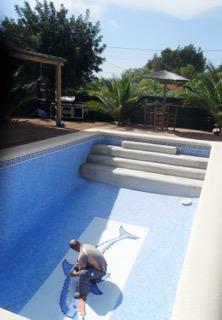 As the pool had to be empty for these works the owners also opted to have a mosaic dolphin installed and then we re grouted the whole pool. We repaired the coronation where the ladders had been mounted and also installed a salt electrolysis system due to the owner’s sensitivity to chlorine. 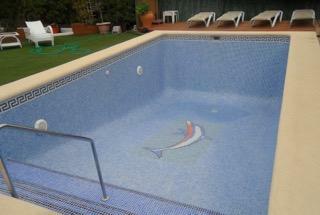 The end result is a swimming pool perfect for the owner’s requirements. 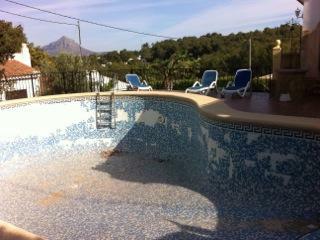 With this swimming pool in Denia the owner had serious problems with the tiles falling off the pool. Due to the amount of damage the only option was to complete a retile. This allowed the owner to choose the tile colours to their personal preference. 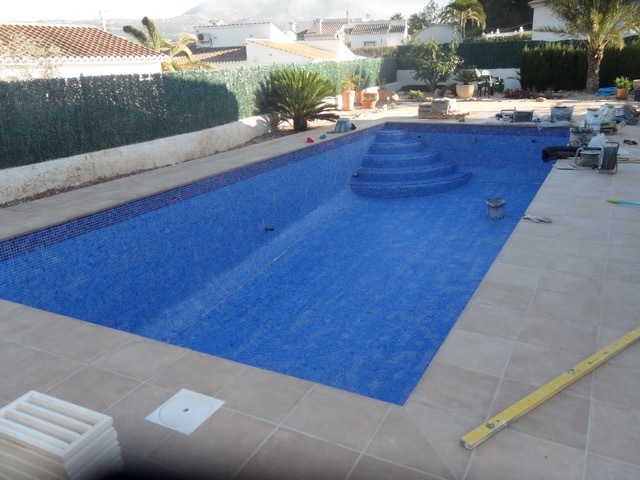 We removed all the old tiles, smoothed out and prepared the pool walls and floor for the new tiles, applied two coats of waterproof material and then retiled and grouted the pool. 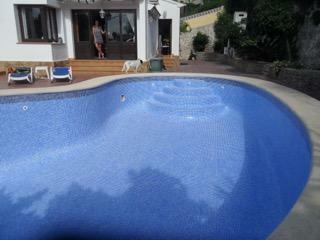 Now the pool looks brand new and has revived the outdoor pool area for the owners to enjoy for many years to come. This swimming pool in Javea is 40 years old. The pool was looking very tired but the construction was in good order. The original mosaics had delaminated and splintered making it very dangerous. The coronation had also began deteriorating so was in need of updating. The owner also opted for steps to be built rather than stainless steel ladders. We retiled the pool and restored the coronation. Most people enjoy swimming in their pool from June to September where the average water temperature ranges from 27 – 30 degrees which is achieved purely by the heat of the summer sun. 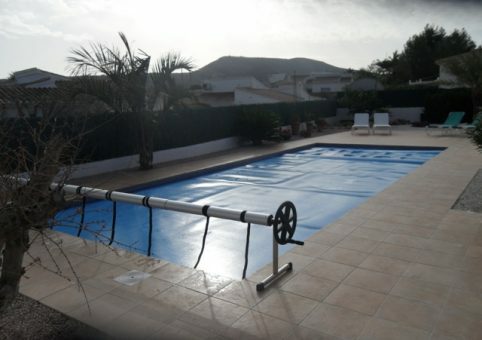 A lot of people who use their villas all year round want the ability to use their swimming pool year round. 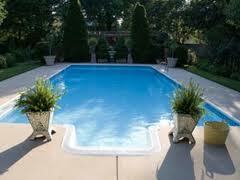 Many people are now opting to heat their pool in the other seasons of the year to allow them to swim all year round. A suitable pool heating system matched to the size of pool and owners swimming requirements can maintain the temperature of your pool 24 – 30 degrees providing a comfortable swimming environment all year round. 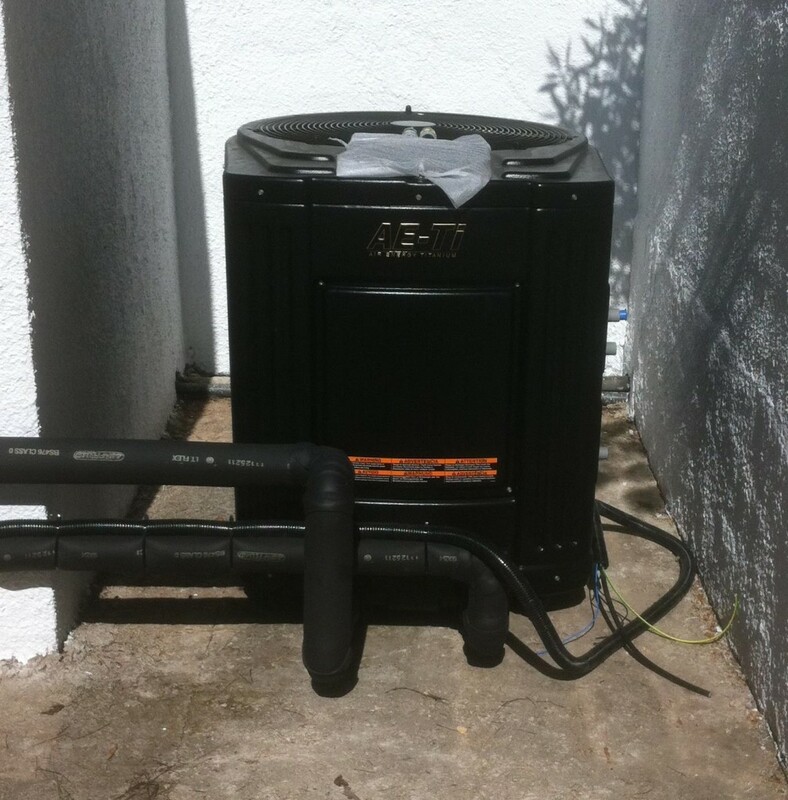 Pool Heater installed by Pool Fix in Javea. Pool Fix are specialists in providing different heating solutions depending on clients requirements and what months of the year they wish to swim. We can you on the best type of heating system depending on your pool size, usage and orientation. 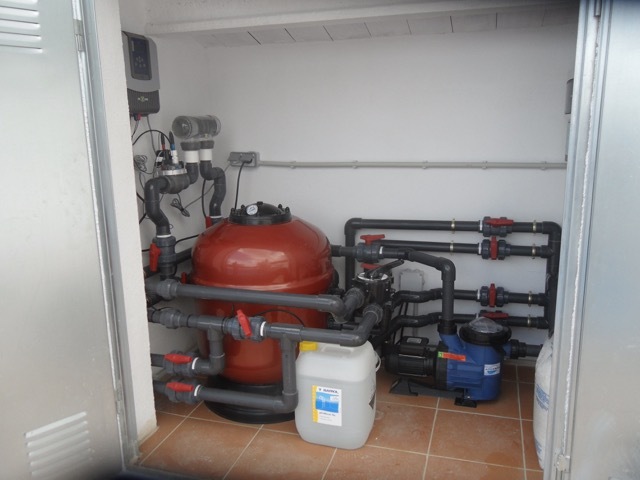 We supply and install electric or solar stand alone units or alternatively use your existing heating system of your villa to extend to heating the pool. Heater prices range from around 2000.00€ depending on make and model and are surprisingly economical to run. 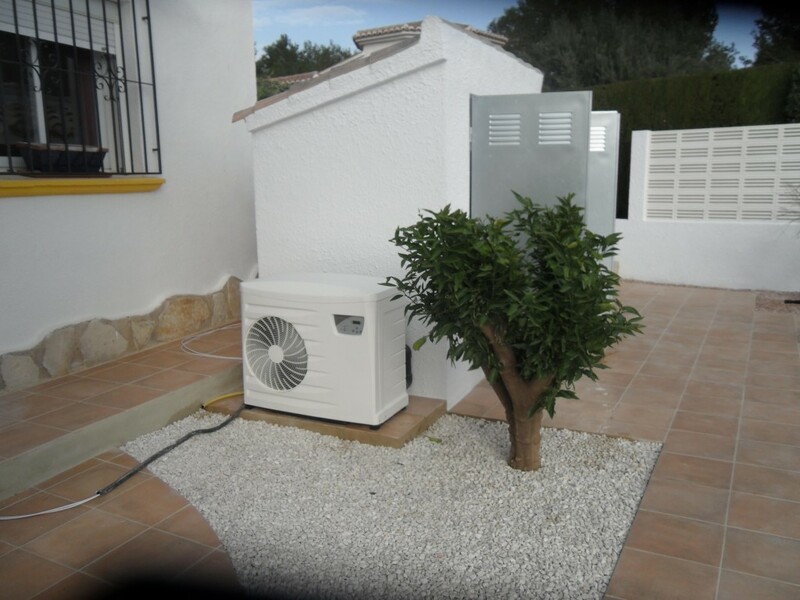 We offer installations in all local areas including Moraira and Javea. 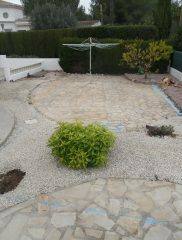 The next stage is to tile the pool to the choice of the client. On this construction the client opted for a dark blue border and step edges to define the steps for entering the pool with a contrasting light blue tile for the rest of the pool. 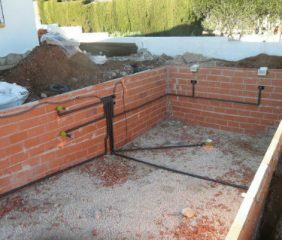 Now the pool itself is finished we construct the pump house. On this build the client opted for pool heating, salt system disinfection, and LED coloured lighting. 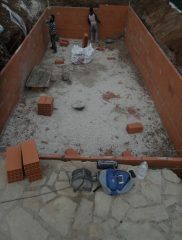 The terracing around swimming pools is often not considered during the construction. We consider the terrace area an important part of the construction process as this is where you will be spending most of your time when using your pool. Due to the space constraints on this construction we finished the terracing direct to the pool edge to give the client more usable space for sunbathing and relaxing. There are many alternatives and we can advise you on different styles. Swimming pool heating costs can be significantly reduced by using a pool cover. Use of a pool cover also can help reduce the amount of chemicals (chlorine, etc.) required by the pool. Outdoor pools gain heat from the sun, absorbing 75%–85% of the solar energy striking the pool surface. Though a cover decreases the total amount of solar heat absorbed by the pool, the cover eliminates heat loss due to evaporation and reduces heat loss at night through it's insulating properties. Most swimming pool heat loss is through evaporation. The heating effectiveness of a cover depends on type. A transparent bubble cover is the most effective, as it allows the largest amount of solar flux into the pool itself. Thermal bubble covers are lightweight UV stabilized floating covers designed to minimize heat loss on heated swimming pools. Typically they are only fitted in spring and fall (autumn) when the temperature difference between pool water and air temperature is greatest. They raise temperature of a pool by around 11 °Celsius, after being on the pool for a week. Bubble covers are typically applied and removed by being rolled up on a device fitted to one side of the pool (see Covers on our Web Page). Covers fall apart after 4 or 5 years due to sun exposure, overheating in the sun while off the pool, and chlorine attacking the plastic. Bubble covers should be removed during super chlorination. 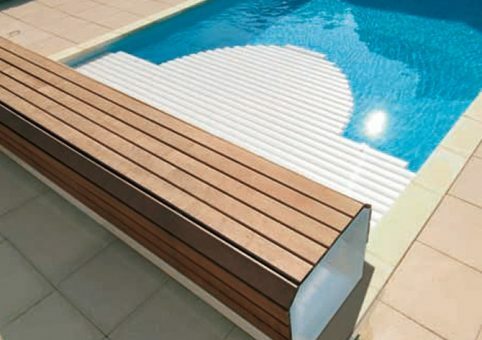 A vinyl cover absorbs more sunlight directly, allowing temperature to rise faster, but ultimately prevents the pool from reaching as high a temperature as a clear cover. Vinyl covers consist of a heavier material and have a longer life expectancy than bubble covers. 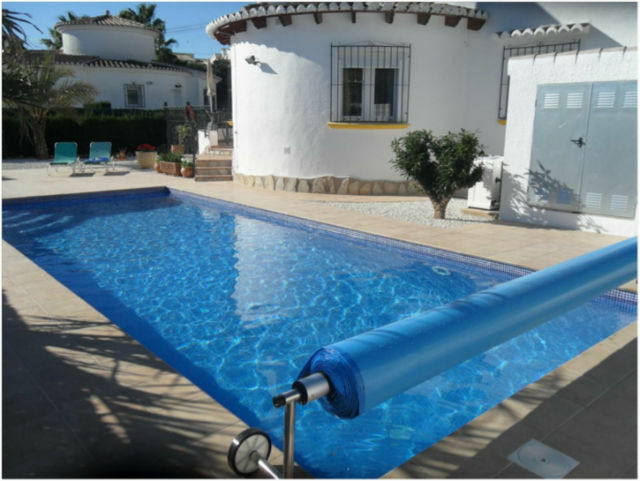 Insulated vinyl covers are also available with a thin layer of flexible insulation sandwiched between two layers of vinyl to be fitted to pools in areas of that have high evaporation This is an effort to conserve water, as much water evaporates and transpires. 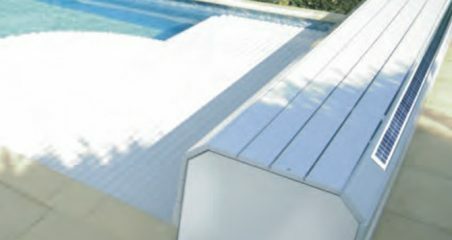 An alternative is a slatted pool cover, which unlike a bubble cover is, ridged enough to put on and off the pool automatically. 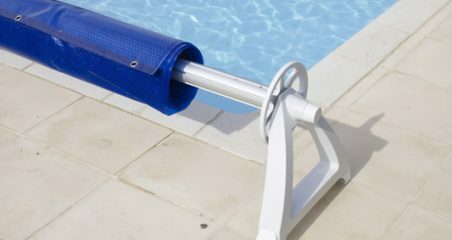 The slats are buoyant so they float on top of the water and are operated with an electric roller which can be sited either in the pit below the water line or above the deep end of the pool. Rollers located in the pit end of the swimming pool are great because it leaves the pool deck Un-cluttered and makes the job of pulling on and off the cover light work. This type of cover is very efficient and is available with solar panels and will help maintain your pools temperature during those very cold winter months. Often used in conjunction with a pool heater this is the ideal cover for those who like to use their pool all year around. Mark out the position of the plumbing work (jets:Skimmers:Lighting etc) and in the case of this Swimming Pool the pipe work for the Heated water Jets. 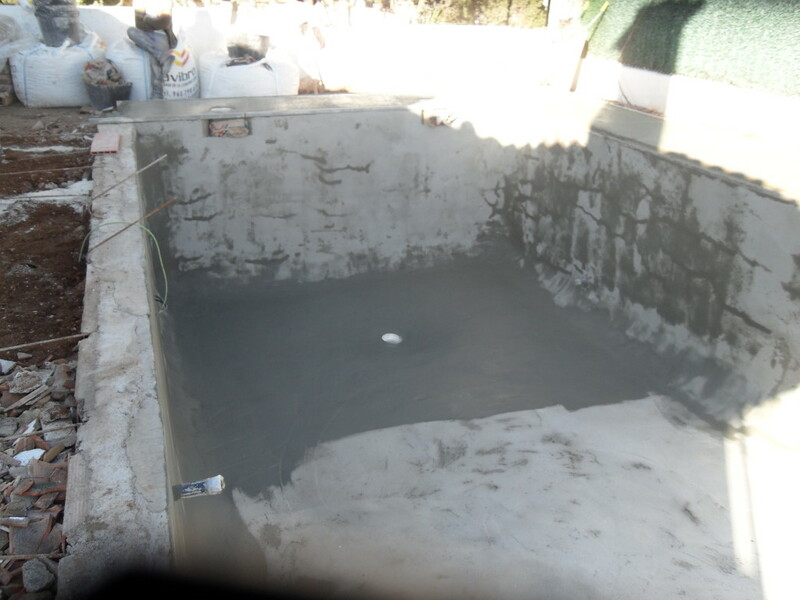 It is now essentials that the Gunite is given 5-7 days to dry before proceeding . During the drying time keep the Gunite from drying out too quickly by dampening it with a hose pipe 3 time a day . This is to make sure that rapid drying time does not lead to the Gunite cracking. 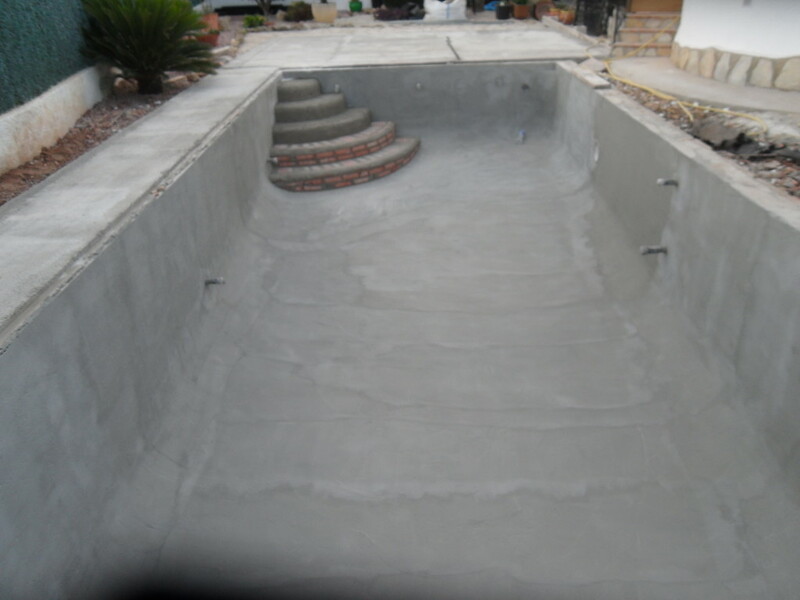 This is not essential as the Gunite is completely waterproof but we always feel as an extra security for a few hours extra work and at little extra cost this will give you that extra piece of mind. This is after all the only time you have this opportunity. Follow us next week for the next stage of Construction………………………. 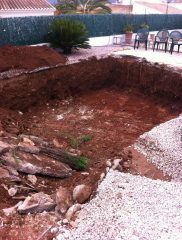 The first job we do in pool construction is marking out the excavation. For this particular pool we were asked to provide a pool big enough for exercise in a confined space. We opted for a 10 metre length by 4 metres wide so as to give the owner a big enough pool for swimming lengths whilst still providing a good sized terrace for relaxation. We had very limited access for this build, a normal driveway. We excavated 75 cubic metres of material in total for this build. Due to the restricted access much of the waste material was lifted out over the villa for disposal. 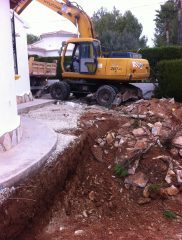 It is essential to have an experienced excavation company for this type of dig. The result, hole dug and no damage to the property. Quite often on the excavation we hit rock. 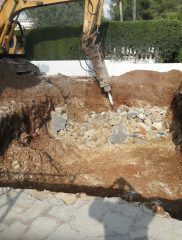 On this build we had to bring the hydraulic chisel for the final metre so we could achieve the right depth for the pool. Now the hole is finished and ready for construction. 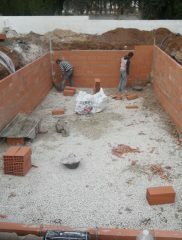 Next we build the outside wall giving the basic shape of the finished pool. 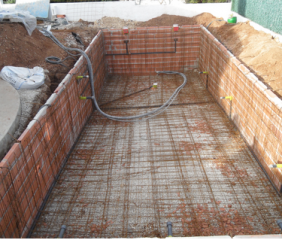 Follow us next week for the next stage of Construction…………..
What should I consider when hiring a Contractor To Build a Swimming Pool? What type of swimming pool and what am I going to use it for? 1. Which type of swimming pool will suit my needs? 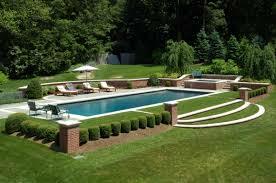 Swimming pools are custom constructions and are built by pool contractors (Builders) with varying standards. All pools are not built the same way; they are not mass-produced in a factory under controlled conditions. With a swimming pool much of what you do not see will impact the cost of pool ownership. 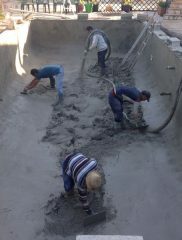 Infact the most important part of your pool construction you will never see. What type of pool do I want and what am I using it for. Is it for family recreation, entertaining guests, physical therapy, exercise or just personal recreation? Would I like to use it throughout the whole year or just in the summer months? 2. Asking plenty of questions. 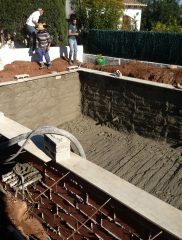 Your builder will be able to explain in detail how your swimming pool will be constructed and its process from start to finish. The more you know and understand about swimming pool construction the better buyer you will ultimately be. This helps you and your pool contractor. Do your homework. Your resources are endless, so use them! 3. Get 2 or 3 estimates. 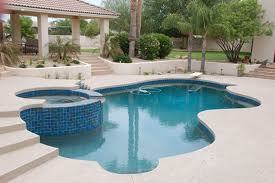 Get 2 or 3 estimates from reputable swimming pool companies, ask around then make your decision and go with it. Don’t go crazy with too many quotes it will only hamper you making the right decision in the end. 4. Not checking out the experience level, history, or background of a Contractor. 5. Shopping based on price. Usually if a deal seems too good to be true, it is! If you shop for price alone you are destined to be disappointed. Bottom line: you pretty much get what you pay for. 6. Shopping over the phone for a pool. It is impossible and a waste of time. If someone can quote you over the phone keep clear it’s impossible! Ask them to come to your home to provide you with an estimate. Visiting a contractor’s place of business will tell you a lot about the type of business it is. Make sure you understand what you are getting into. Make sure everything is in writing. The contract should protect you and the contractor. If you are not 100% sure don’t sign it! 8. Remember there is more to your pool than just aesthetics. Flow rates, pipe size, pump and filter types, chemical management systems, and many other factors will make a difference in the enjoyment you get from your pool and its cleanliness and hygiene. 9. Am I restricted to shape and design? Your restrictions are as limited as your imagination although most pools are rectangular or kidney shaped the shape of the pool is down to you, generally the prices for more elaborate swimming pools are only represented by the quantity of materials used. The most popular choice of pools constructed in Spain are “gunite” because it is highly durable and can be created into just about any shape. Gunite is a mixture of concrete and sand , this method is preferred as it exceedingly durable and pools made from gunite are designed to last. 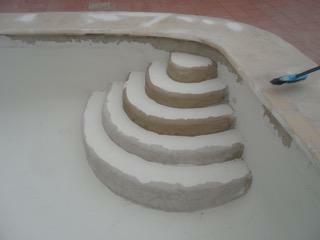 Adding to their versatility gunite swimming pools allow you to create an unlimited array of shapes and designs.